Angels: The Discovery, by Starr Lee Bryant, is the touching and sometimes harrowing tale of one boy’s ascent to Heaven. As young Fraser awakens in an unfamiliar and empty room, he struggles to remember how he arrived there and why he feels simultaneously at peace and full of an unexplained energy. Fraser becomes acquainted with several other young people in the same boat. Soon enough, he and the others are oriented to their surroundings, briefed on the details of their arrival in Heaven, and allowed to choose jobs within the kingdom–except Fraser. Even amidst the serenity, Fraser finds himself fighting to understand his true place and purpose among the other angels. I was immediately struck by Bryant’s depiction of Fraser’s first moments in Heaven. He is overwhelmed but, at the same time, curious and calm. His surroundings are described in the most vivid and tangible details. The reader shares the main character’s peaceful and comforting sensation as he/she enters the first chapter. Bryant spends a great deal of time illustrating the pristine and comfortable quarters to which Fraser is oriented by Gabrielle, his assigned guide. Bryant uses her cast of characters to emphasize two major aspects of Heaven. She has created Fraser in order to show readers the freedom from pain and suffering found in Heaven and to underscore the fact that those who make it to Heaven are, indeed, believers of God (The Big Guy). I was moved by the flashbacks Fraser experiences with increasing intensity and clarity. As he begins to learn more about the way he reached Heaven, he sees scenes from his life on Earth in a new way–a way he never would have been capable of as a mortal. Each of Bryant’s characters contributes to the plot in a unique way. I am quite partial to Ms. Jamerson, Fraser’s orientation instructor. She’s unflappable and more than willing to provide detailed explanations to Heaven’s newest residents. One of the most unique aspects of Bryant’s depiction of Heaven centers on the angels’ relationships with their loved ones. The grieving process is very much an earthly sensitivity. Fraser learns quickly that, though he still loves the family he left behind, his feelings toward them will be much less sad, and the expected pining for their companionship and closeness is a not an emotion with which he will battle. As beautiful and as perfect as Heaven and the angels are drawn in Bryant’s work, her narrative regarding the dark angels is breathtakingly disturbing. The author draws chills from the reader with Fraser’s first encounter with the dark angel hovering above his family. Bryant goes on to describe amazing scenes in which the dark angels seem to be silently dominating life on Earth. 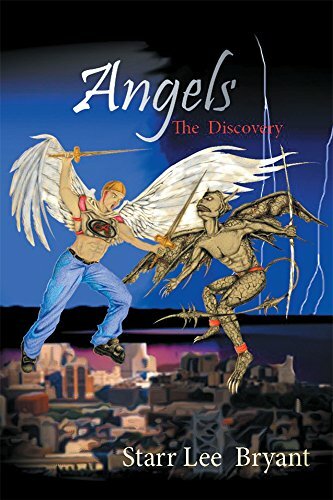 Angels: The Discovery, by Starr Lee Bryant, deserves every one of the 5 stars I am giving it. Bryant provides a thought-provoking account of life after a hero’s death for believers in Christ. I found Fraser’s “choice” of job as both fitting for him and a wonderful tie-in to his concern for his family’s welfare after his death. In addition, Bryant leaves the door wide open for a stirring sequel featuring young Fraser.